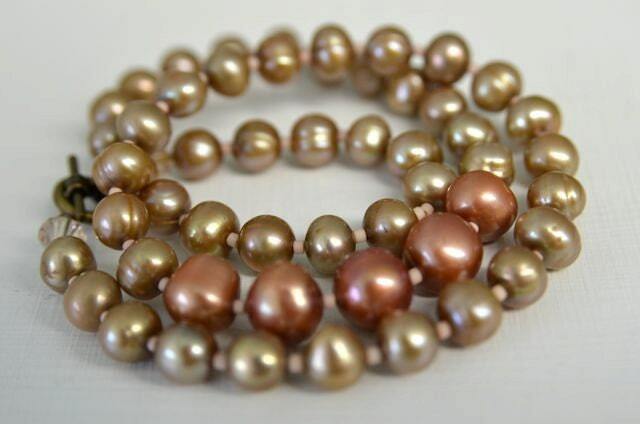 I created this beautiful pearl necklace with five 9mm freshwater pearls, forty-eight 6mm freshwater pearls, two Swarovski crystals as end caps and soft matte pale pink glass seed beads. This necklace is 18.75 inches (47.6cm) long and has an antique brass toggle clasp as its closure. The earrings are made from the same blush and sand pearls. They hang 1.5 inches (3.8cm) long from top to bottom. I used light antiqued fish hook ear wires. All of my jewels are made to last a lifetime. Tangerine and Brown Pearl Long Necklace and Earring Set with Natural Ocean Jasper "Intensity"
Pink Amethyst Necklace with Pearls & Crystals Spring Jewelry "Bubble Gum"